The Retros play at wedding parties. The band has married off many attractive couples! 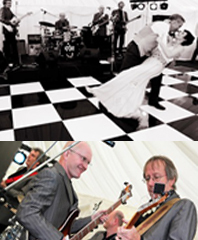 It is always a delight to play at these functions whether they are in country houses, hotels, marquees or village halls. We have been known to play special 'our song' requests from Simply Red to R.E.M. !